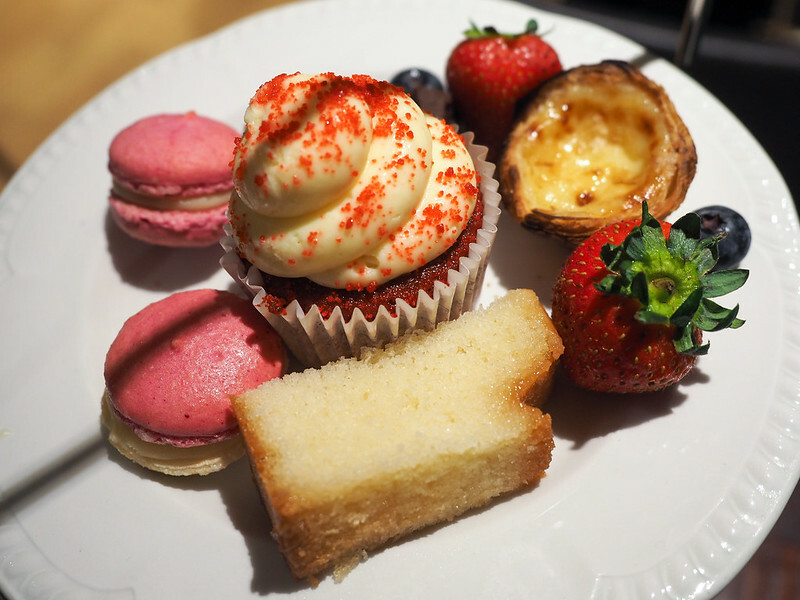 Going for High Tea is one of those quintessential English experiences – the little teapot, the tiny sandwiches, the scones with jam and clotted cream… It's something that's practically required if you're visiting London for the first time. 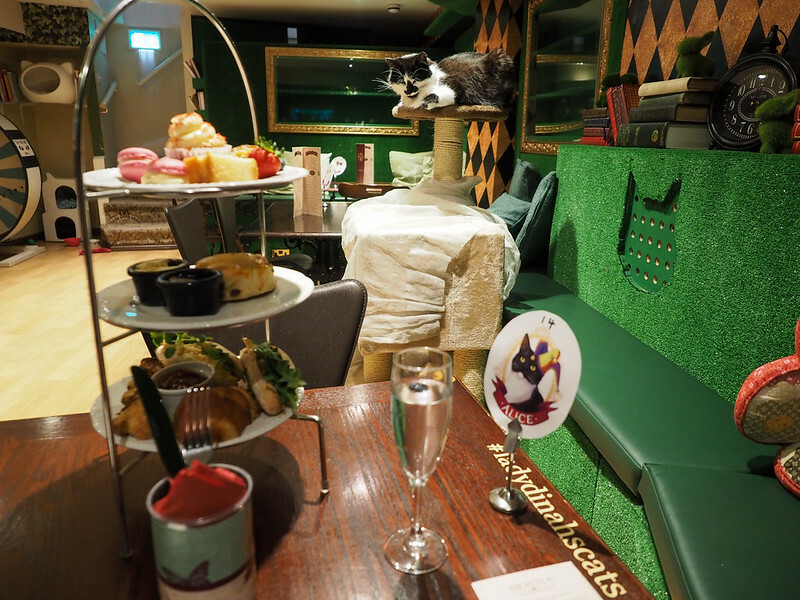 But what if I told you that there was a place where you could have High Tea surrounded by a dozen furry friends? 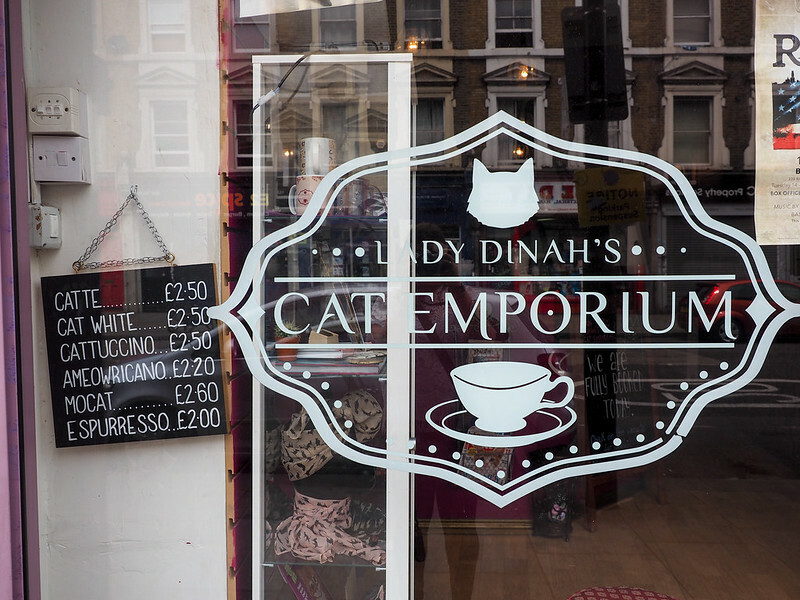 Let me introduce to you Lady Dinah's Cat Emporium, London's very first cat cafe. 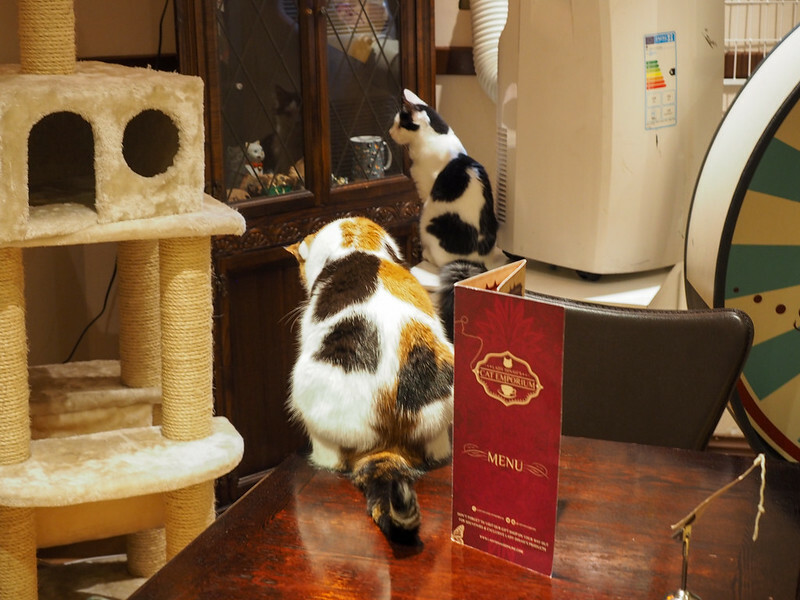 The concept of the cat cafe began in Asia, where many people live in apartments too tiny to own any pets. The cafes (there are also dog cafes, rabbit cafes, and even an owl cafe!) offer a place for petless people to go and enjoy time with cuddly animals. 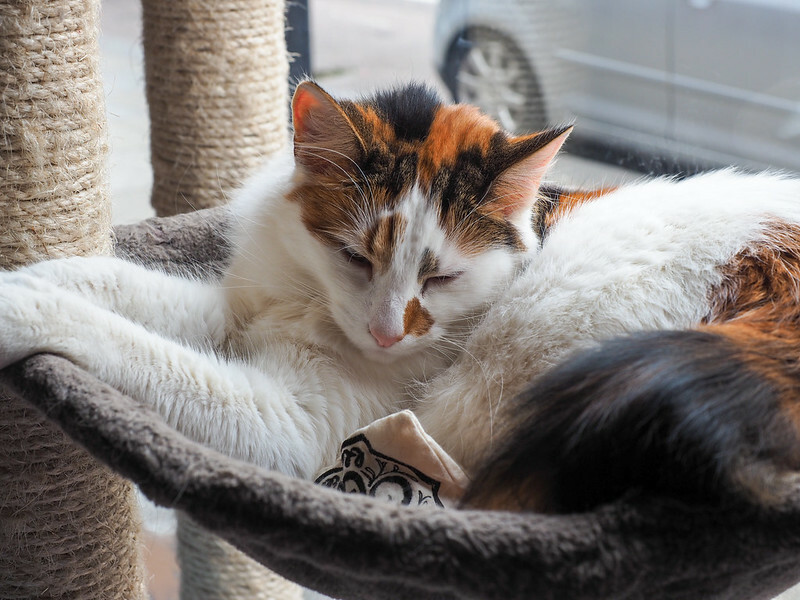 The concept has slowly begun spreading around the world, and London's first cat cafe opened in 2014 in the city's Shoreditch neighborhood after a successful crowd-funding campaign. 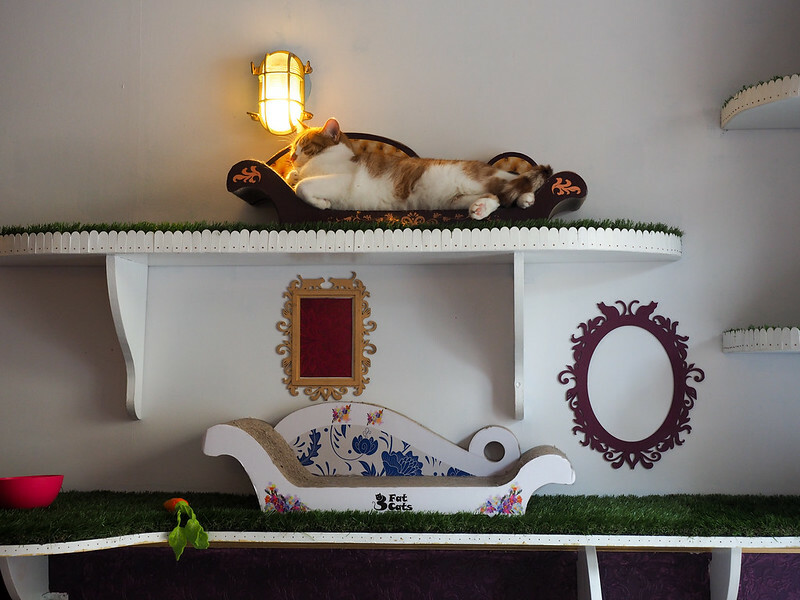 Today, Lady Dinah's Cat Emporium has many of the trappings of your average cat cafe: cats of all ages and personalities (all of which have either been adopted or rescued off the street), a fun and whimsical environment with plenty of hiding places and toys, rules to follow in order to keep the kitties safe and healthy, and a unique cafe/tea menu. Finding Lady Dinah's is pretty simple. 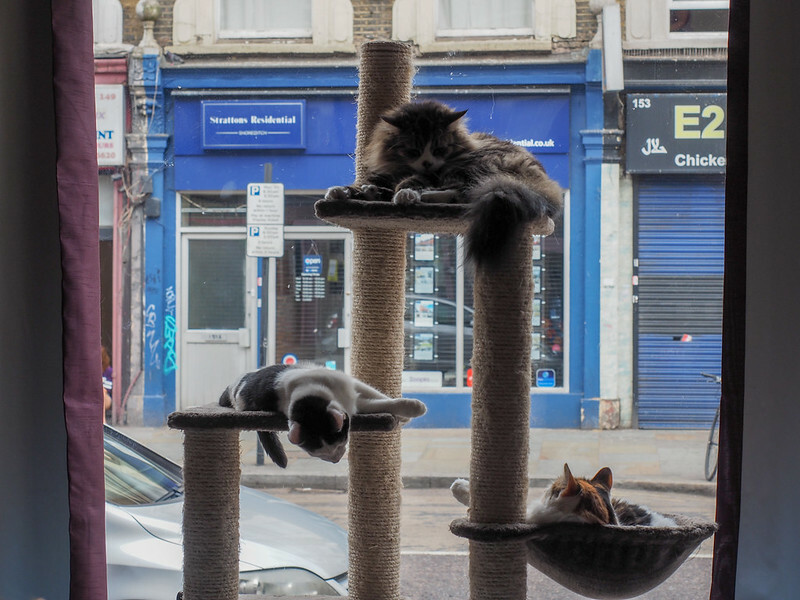 It's located on Bethnal Green road in Shoreditch, not far from Old Spitalfields Market, and you can't miss the floor-to-ceiling window that usually has a number of cats lounging in it. You'll want to arrive at the time you booked a table (like any normal restaurant reservation), and then will be taken inside to wash your hands and hear all the house rules. The rules are pretty simple: you can play with the cats that are roaming around, but you're asked to leave sleeping kitties be. You're also asked not to feed any the cats, and you're not supposed to pick them up, either. After this, you'll be taken to your table either upstairs or downstairs. 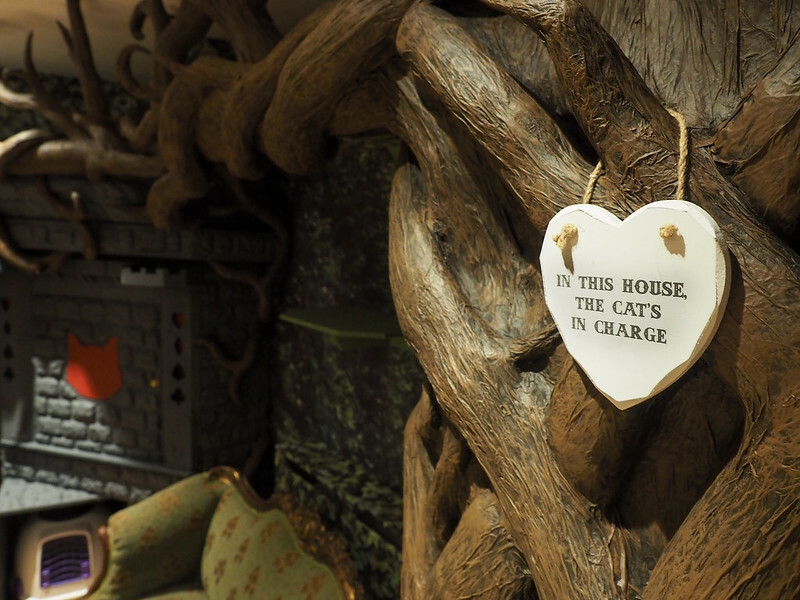 The downstairs area is my favorite, as it's decorated like an indoor forest, complete with giant tree in the middle with plenty of hidey-holes for the cats to enjoy. Lady Dinah's has two types of staff on the floor at all time: The wait staff who will take your order/bring you food and tea, and the cat staff who are in charge of amusing the cats and telling you all about them. If you want to know a specific cat's story or know what his/her favorite toy is, the cat staff are only too happy to help. I would LOVE to have a job like this! On my first visit to Lady Dinah's, I simply booked a table and ordered a coffee and slice of cake. 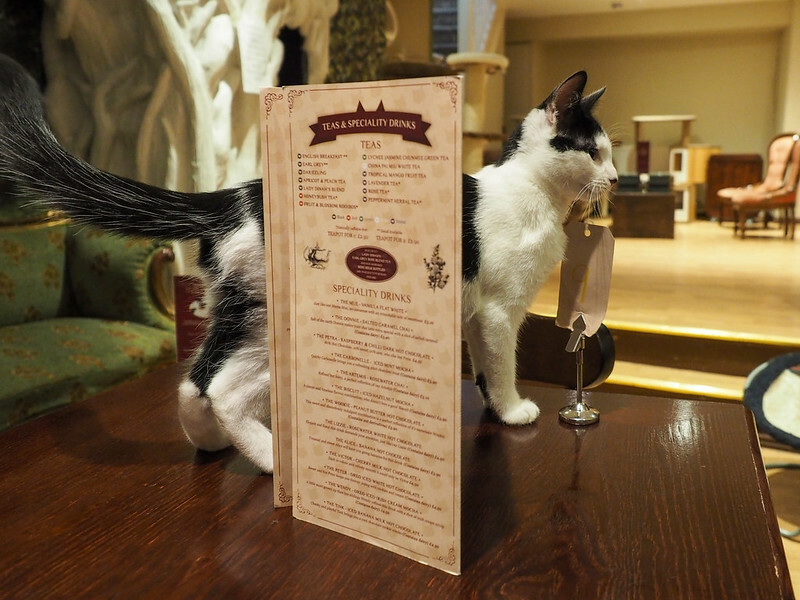 Their menu includes everything from specialty teas and coffee drinks (named after the resident cats), to bagels, to cake. From what I've heard, their menu has improved immensely since they opened in 2014 – and they cater to all diets, including gluten-free and vegan. 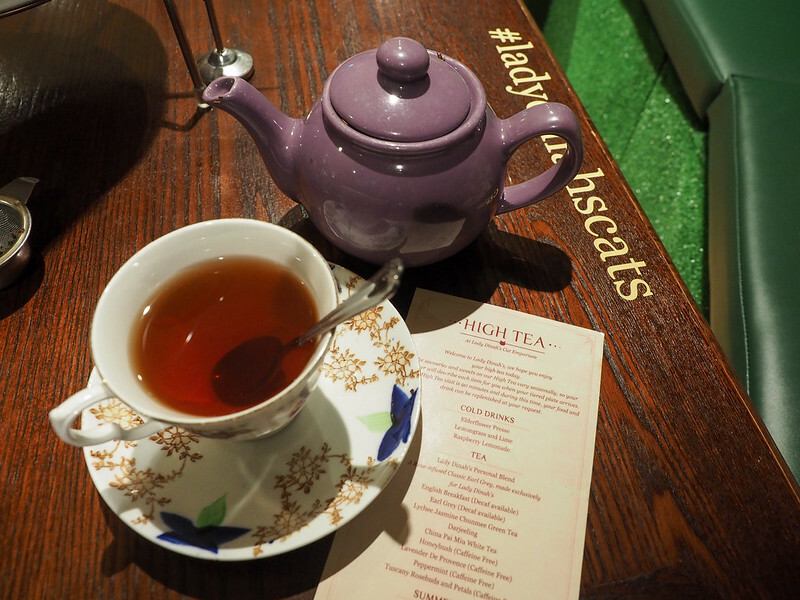 On my second trip to Lady Dinah's, I decided to book High Tea. They serve High Tea Friday-Monday and it costs £35 per person. You get a three-tiered plate of sandwiches, rolls, scones, jam, cream, pastries and cakes, which you can request unlimited refills on during your 90-minute time slot. I didn't even finish my first serving, and they nicely wrapped up the leftovers for me to take with me to snack on later. And, of course, you can enjoy the antics of the cats as you have your tea. Lady Dinah's Cat Emporium is open every day except Wednesday from 11:00 a.m. to 6:00 p.m. (12 p.m. – 8 p.m. in winter). The cafe is not really meant for kids, and has a minimum age of 12. You don't *have* to book a table ahead of time, but I would highly recommend it as the place does get very busy and has an extremely limited number of walk-in seats available. 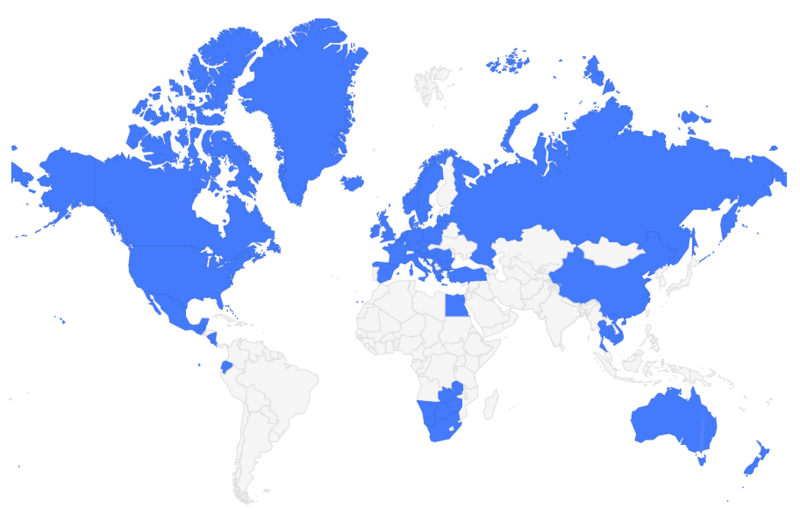 How far in advance should you book? I would book High Tea at least a few days in advance (in some cases you may even need to book the week before), and regular tables 1-2 days in advance to avoid disappointment. 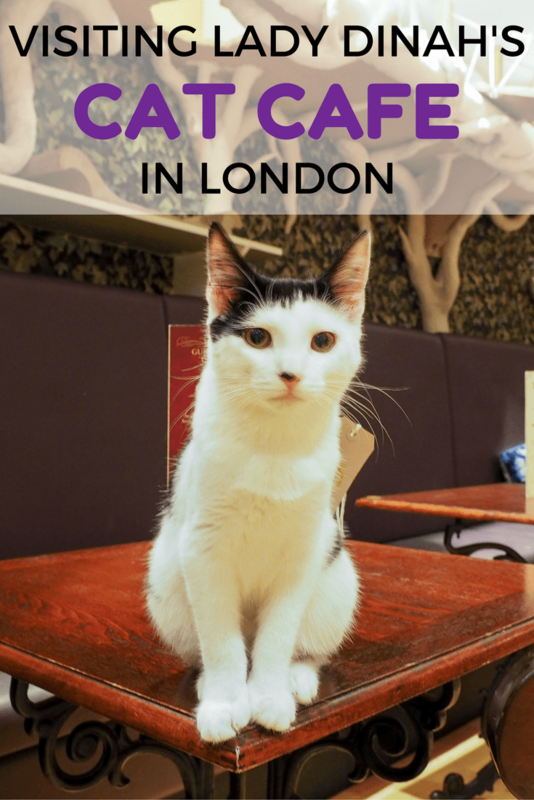 Have you ever visited a cat cafe on your travels? Would you? This is SO high on my list of things to do in London. Highly recommended! The place is adorable, the food is good, and the cats are so fun. Okay, I have to know…How the heck do they keep it so clean? I mean, I would think there would be cat fur floating in the air and getting into food! Bleh! Okay, so I was at least aware that cat cafes existed before, but the concept is so much more adorable now that I’ve seen it in pictures! Love that they have a dedicated “cat staff” too. Was this somewhere you went by yourself? I always feel a bit awkward at sit down restaurants when I’m alone. Though I suppose the beauty of this place is that there are kitties to cuddle and the cat staff to talk to! Yes, I went by myself (twice)! It’s actually a great place for solo dining since once you get to your table and order/eat your food, you can spend the rest of the time wandering around the cafe to play with the cats or take photos or whatever. Oh my god that is soo cute. I couldn’t drink or eat anything, just loving the cats. It’s such a fun place, and you can tell that the cats there are all very spoiled and happy. I love that they have cat staff! The cat cafe I went to in New York had a book with info about the cats, but it must be much more fun to talk about the cats with someone who knows all about them. Definitely! They know a lot, too, including what kind of pats and toys each cat prefers! 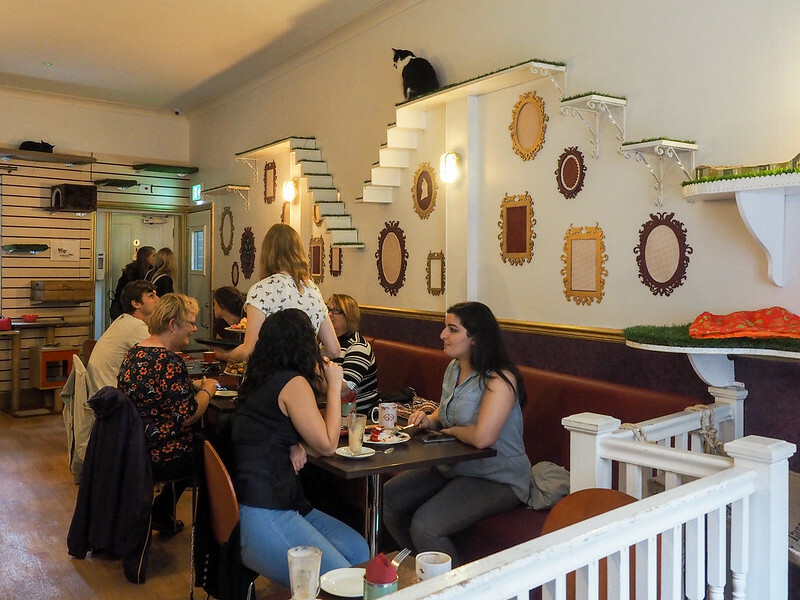 This was the first cat cafe I ever visited, but I’ve since been to another in Lithuania and will definitely visit more on my travels! I love cats so much, and if I’m going to have a meal anyway, why not also enjoy some adorable cats? What an awesome business idea. Too bad it would never work here in the US with stricter health codes (the whole food part). I totally open a dog restaurant. 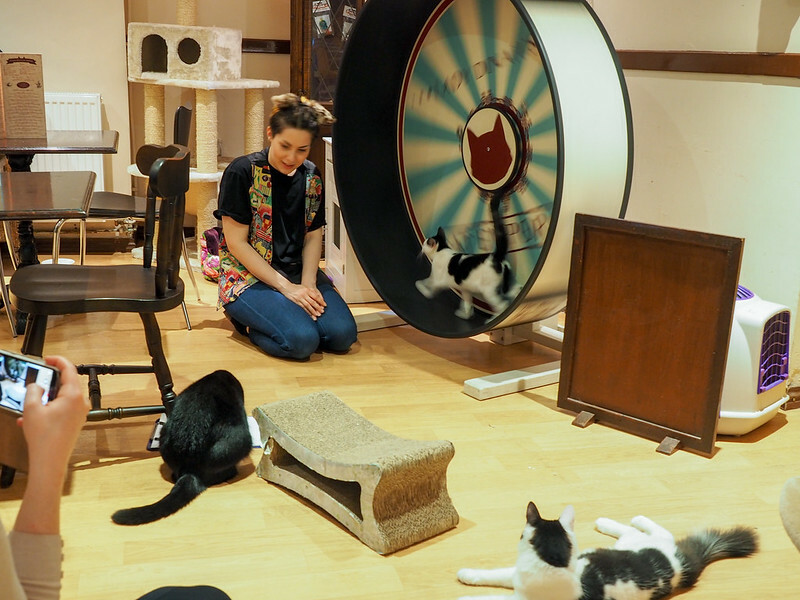 I want to go to a cat cafe SO badly! I have always had cats or dogs growing up, but my apartment in Vancouver doesn’t allow pets, and my family pets live across the country. You are in luck! 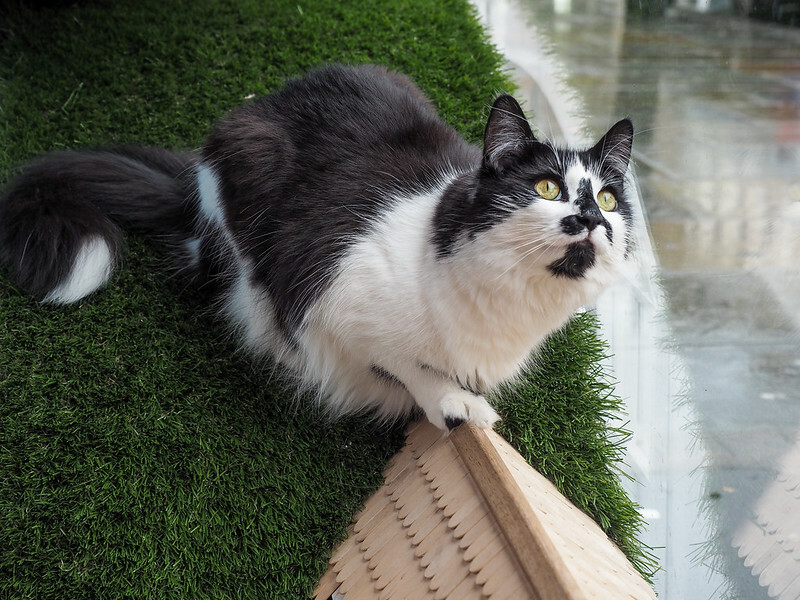 There’s a cat cafe called “Catfe” in Vancouver! You should go check it out! I’m super allergic to cats 🙁 But it might be worth it to pop a few allergy pills and go here anyway cause it looks like so much fun! Awww animal allergies are no fun! I’m not sure what I would do if I was allergic to cats! Cute! I skipped visiting cat cafes in Seoul because I heard some bad things about it; this one looks nice though! I liked the cats crawling over my lap in Istanbul, so I think a more controlled cat cafe would certainly be something I like! I suppose they vary just like regular cafes do. I really like this one, though! So wish this had been around when I lived in London and was missing having a cat! I have two of my own now but there’s always more stroking to go around, will have to go and check it out. Oh yes, you can never have too much kitty time in my opinion! This cafe sounds so great! I have two cats of my own who are absolutely adorable, even if I say so myself lol! I’ve just got back from Taiwan where they have loads of animal cafes but I wasn’t able to make it to any, and for that I’m really sad! And now there’s one in London. Yay! This place sounds perfect! I love the atmosphere of cafes, and I think my biggest weakness is cats. I think that my new dream job is to be a member of the cat staff! That would also be one of my dream jobs for sure! 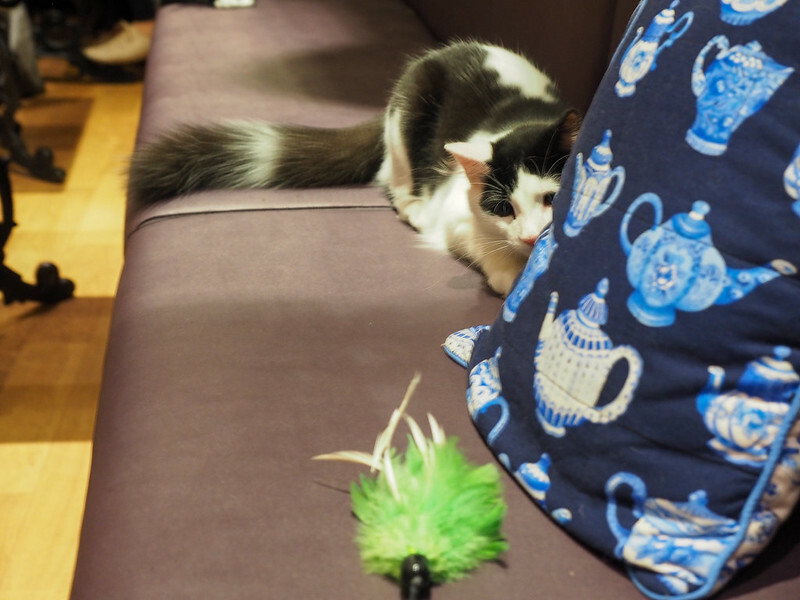 I’ve been to cat cafes in Vilnius, Copenhagen, New York, and this one when it first opened. All the cafes are so awesome and clean, and really help when I feeling homesick for my cat during my travels. I went to the one in Vilnius, too! I agree – a great place to go if you’re in need of some kitty cuddles.